The country’s current bank legislation can be amended to ensure that banks redirect their investment focus towards Papua New Guinea’s renewable sectors, according to Trade Minister, Richard Maru. Minister Maru says this would require banks in PNG to invest a certain percentage of their revenue, into agriculture, fisheries, Small to Medium Enterprises, SMEs, and tourism. “So in the PNG context, if banks want a license to operate in Papua New Guinea, they must lend a certain percentage of their loan funds to these sectors and that must be imposed by law,” said Minister Maru. At present, 70% of the country’s revenue is derived from corporate taxes and cash flows from the extractive industry trading against commodity prices, which depict a constant downward trend at present and have been for several months. The same message was conveyed to the nation through Treasury Secretary, Dairi Vele during last week’s 2016 Leaders’ Summit, hosted by Prime Minister, Peter O’Neill. Minister Maru, says the country’s economy, through a government-bank synergy can be the answer in rejuvenating PNG’s renewable sector, which includes 6.1 million people directly or indirectly involved in agriculture. “The sectors that need to be grown are the sustainable such as, agriculture, SMEs, fisheries and tourism and these sustainable sectors will never grow without significant investment and technology." “One the biggest problem in PNG is investment fund not reaching these sectors, despite millions and billions that are going to the banks,” said Minister Maru. The country’s most extensive bank with the largest customer base, Bank South Pacific responded to Minister Maru’s recommendations. BSP Group CEO, Robyn Flemming said BSP invests about K100 million to the SME sector while K300 million is injected into commercial agriculture. “We’ve got the best part between K80 million and K100 million in loans to various SME sectors. “SME is somewhat more viable then agriculture – agriculture is not high-risk but it’s certainly one that requires a lot of direct support from a training perspective, perhaps some form of support to be able to have the equivalent of a stabilization component so that when commodity prices are down, people still have some capacity to be able to reimburse loan repayments and banks can be innovative, in terms of the repayment structure,” Flemming said. 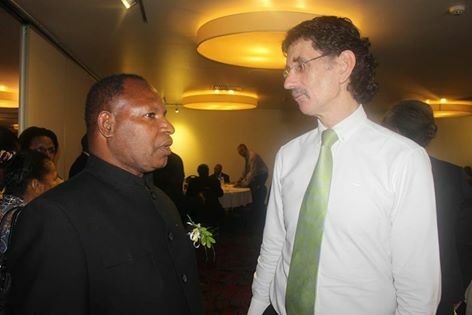 Photo Caption: Trade Minister, Richard Maru (left) having a chat with BSP Group CEO, Robin Flemming.